The mechanics of sharing the Gospel are often overlooked in today’s entertainment-saturated environment. Often it is difficult to know how and when to share the “hope within us” with others. 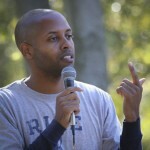 Leon Brown, assistant pastor of New City Fellowship (PCA) in Virginia, can often be found sharing the Gospel in open-air settings when not teaching or engaged in pastoral work. 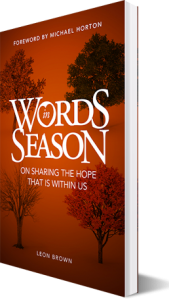 Leon shares his insights in his new book Words in Season – On Sharing the Hope that is Within Us. Leon seeks to encourage believers to use their own unique personalities and gifts in evangelism. Leon Brown provides a brotherly, convicting, yet encouraging word designed to help all believers overcome their fears and become salt and light as bearers of the gospel. You can find Words in Season at Amazon. Dr. White mentioned his upcoming trip to South Africa, (donations are still needed!) Dr. White then responded to Chris Pinto’s conspiracy theories and suggestions from a recent radio program. Then in the second half of the program, Dr. White fired up Radio Free Geneva to respond to a video by Dr. Jerry Walls. James talks about his trip to Omaha and Tour de Apologia, Jason Collin’s “coming out”, a letter about homosexuality on a blog and even takes calls! James was on Issues Etc. on 4/29 talking about the Qur’an and its teachings. / Comments Off on HELP! Travel Assistance Needed! Dr. White has two debates scheduled in Ireland… but we desperately need your help to get him there.